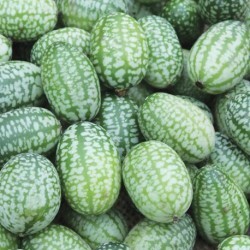 Passandra is a top quality mini all female cucumber. Good resistant to cucumber mosaic virus and tolerant to powdory and downy mildew. Grows very well in an unheated greenhouse. Cucumbers were once thought to be difficult to grow from seed, but new varieties are making it easier all the time. They can be grown in the garden, or in a greenhouse. The most difficult part is choosing which variety/varieties you want to plant. This decision is mostly based on what you plan on using them for: is it for fresh eating, or do you want to make dill pickles? Types of cucumbers. 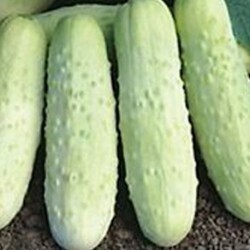 There are two basic types of cucumbers; the Ridge variety and the Greenhouse variety. The Ridge type are grown in the garden, and spread out along the ground. These are best used for pickling and relishes. The Greenhouse type is, you guessed it, suited best for the greenhouse. These are a longer, smoother variety and are grown along vertical supports. They are more suited for salads, sandwiches and fresh eating. Planting the seeds. It is often tempting to go to your nearest bedding plant outlet to get young cucumber plants, but they are easily grown from seed. For an earlier crop start your seeds indoors, preferably in a peat pot so the roots do not get disturbed when they are being transplanted. 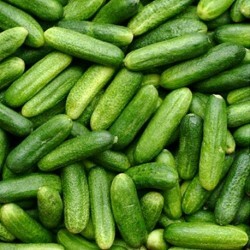 As cucumber seeds prefer heat, it is best to plant them in soil that is at least 15 Celsius. This way, there is less risk of them spoiling due to cooler temperatures. Place one seed ½” deep in each compost filled 3” peat pot. They will germinate in 2 - 3 days, so schedule your seeding time to be about 4 weeks before you’re ready to plant them in their permanent spot. Be sure to keep the compost moist so your seedlings don’t dry out. They do not recover well from drought conditions. Cucumber seedlings don’t like to be root-bound, so transfer them to a 5” pot if the roots are filling the pot. Growing in a greenhouse. When your greenhouse is above 15 Celsius through the night, you can transfer your seedlings into bigger containers, being careful not to disturb the root system. When plants are 8-10” high and have two well-formed true leaves, plant one seedling per 12-15” pot. An alternative is to use growing bags, which can have two seedlings. Be sure to water the pots/growing bags thoroughly before adding the seedlings. Cucumbers like to be continuously moist and thrive in high-humidity (but not soggy) environments. Ensure they have adequate drainage and ventilation. They will require damping down when the temperature rises in the greenhouse. When damping down, the water is sprayed on the floor, not the plants. This maintains the humidity level they require, but does not get the leaves wet (which can lead to disease). By providing shading material, you can protect your crop from the heat of the hot, mid-summer sun. 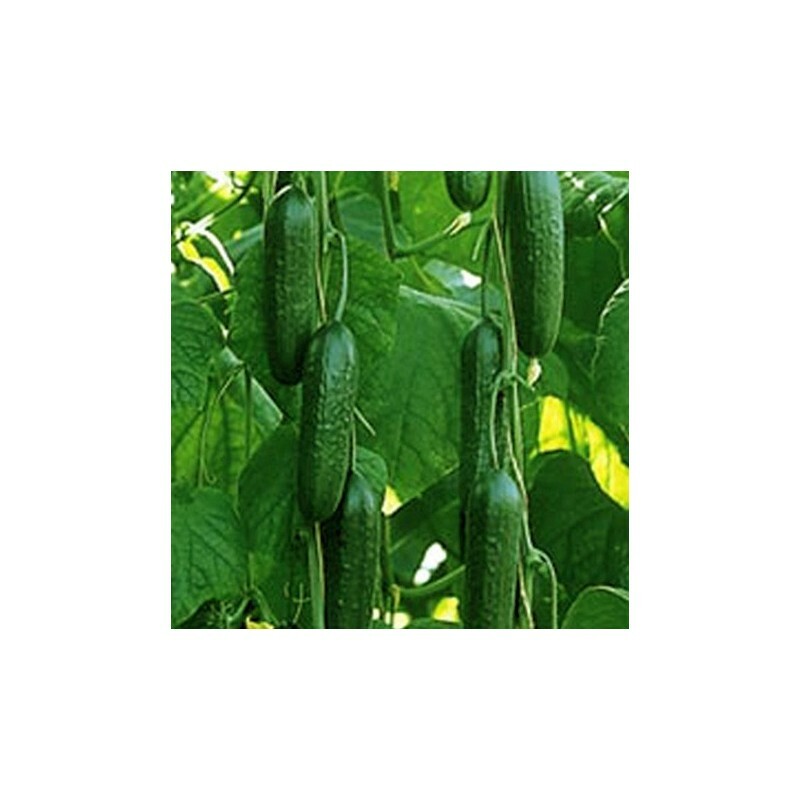 In order to utilize your space, and keep your cucumbers clean, offer them support to climb, such as wire or stakes. Commercial mesh is available if you prefer not to use twine or stakes. When using any support be sure it is properly secured, as the fruit does get heavy. Planting in the garden. As it takes longer for the soil in the garden to warm up, it’s important to wait until all risk of frost has passed. Keep a close eye on the forecast, and have cloches or other means available just in case the temperature dips below 15 °C. As with planting in a greenhouse, the seedlings should have at least two true leaves. When planting in the garden leave 30” between plants so the vines have plenty of room to spread out. An outdoor garden environment is ideal for the pickling varieties, as there is generally a lot more space than in a greenhouse. If you are planning on making several jars of pickles or relish, you will need a large number of plants. As you will have less control over the environment, it’s better to plant a few more seedlings than you think you’ll need. It’s much harder to protect a crop from a hail storm or downpour out in the open. No one has an umbrella THAT big. 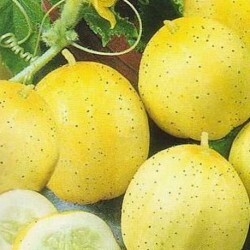 You can also directly sow cucumber seeds in the garden, which will result in a later crop. An option for a longer season is to start some seedlings indoors, then plant them in the greenhouse or garden. After they have been transplanted into the garden, direct seed some as well. This way, you will have fresh cucumbers well into September or October. Be prepared to have a surplus when staggering your seeding/planting times. Also, should there be an early frost, be prepared to cover your cucumbers. Growing cucumbers from seeds is relatively simple, as long as you take the plant’s needs into consideration. The most important thing to remember is to plant in warm soil, and ensure they don’t dry out. Many varieties mature in as little as 60 days or less, so even if you have a short growing season you can still grow cucumbers.